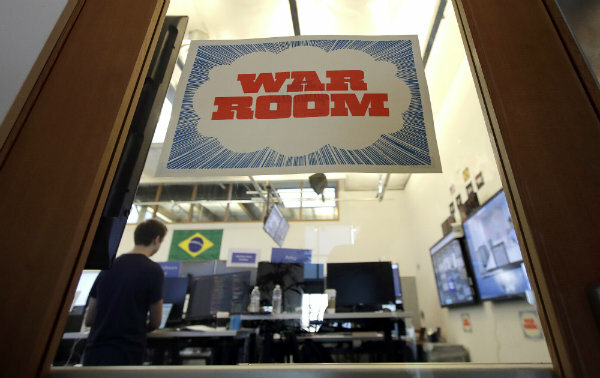 The war room is a major part of Facebook's ongoing repairs. Its technology draws upon the artificial-intelligence system Facebook has been using to help identify "inauthentic" posts and user behavior. Facebook provided a tightly controlled glimpse at its war room to The Associated Press and other media ahead of the second round of presidential elections in Brazil on Oct. 28 and the U.S. midterm elections on Nov. 6. Facebook disagrees with that assessment, although its efforts are still a work in progress. Chakrabarti, for instance, acknowledged that some "bugs" prevented Facebook from taking some unspecified actions to prevent manipulation efforts in the first round of Brazil's presidential election earlier this month. He declined to elaborate.